Songs by Heart is featured on Phoenix’s Fox 10 News! Nancy Gustafson hopes to improve the lives of people with Alzheimer’s disease and other forms of dementia through the power of music. A Bienen School artist in residence and a professional opera singer for more than 30 years, Gustafson (G80) founded the Songs by Heart Foundation to bring quality-of-life-enrichment programs into retirement communities nationwide. 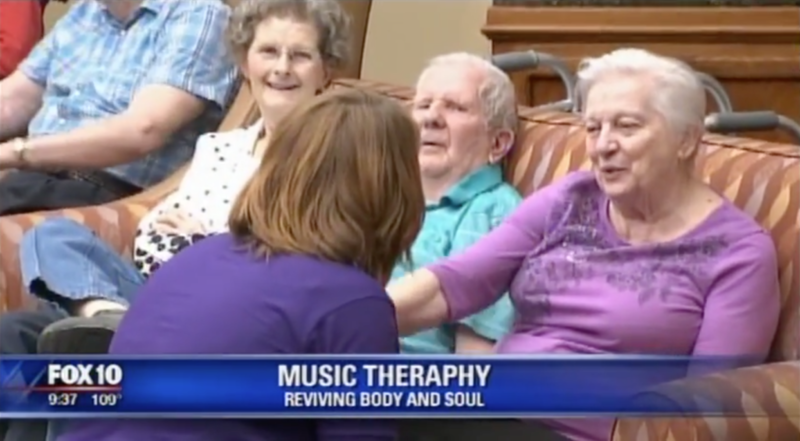 Through interactive live music programming, the organization aims to improve the intellectual, physical, social, spiritual, and emotional well-being of those with age-related memory issues. A key aspect of the Songs by Heart sing-along program is the interaction between musicians and residents. 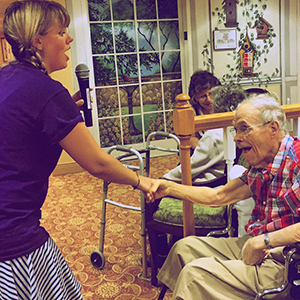 Before and after each session, the vocalists shake hands with every resident in attendance, making eye contact while welcoming them or thanking them for listening. Throughout the performances, they hold hands and sometimes dance with residents to further connect them to the music and their emotions. A music-therapy consultant oversees the musicians and trains them to work with people with dementia. In order to be selected for the program, artists must demonstrate strong interpersonal skills as well as exceptional musical talent. Several Bienen School of Music alumni have participated in the outreach program, including vocalists Emily Becker (G08, CP09), Caitlyn Glennon (G11), Sarah Simmons (G10), and Ethan Simpson (G15) and pianists Jason Carlson (04, G07) and Ellen Morris (G14). Gustafson was inspired to establish Songs by Heart after her mother—a 1949 Northwestern graduate—developed Alzheimer’s disease. Frustrated at being unable to communicate with her mother on any level, Gustafson turned to the piano. She was surprised when her mother commented on the playing and singing after only a few minutes—first saying that it “wasn’t very good” and then agreeing that it was much better after Gustafson switched to a different song. After that breakthrough, Gustafson and her sister arranged for a music therapist to visit their mother once a week and for a vocalist to sing with her two days a week. Impressed with her mother’s continuing response to music, Gustafson knew she wanted to find a way for others with dementia to have daily access to a program that could improve their quality of life through music. The Songs by Heart pilot project helped Gustafson and her team develop best practices for interactive programming under the guidance of several consultants, including Mary Ann Anichini, vice president of continuous quality improvement at Presbyterian Homes. Anichini tracked residents’ engagement at all three locations during the 12-week period to measure the program’s effectiveness. Interviews with family members and caregivers suggested that resident participation and alertness continued even after a given music session ended. Building on these initial assessments, Gustafson is collaborating with fellow Bienen School faculty member Steven Demorest, professor of music education, and Darby Morhardt, research associate professor at the Feinberg School of Medicine’s Cognitive Neurology and Alzheimer’s Disease Center, to develop a more controlled research study and gather additional data.